I love desserts. I also love street food events. However, bringing the two together is not always easy: in my experience, there is usually a noticeable deficit of street food-friendly sweets. Thank goodness for Tatas! 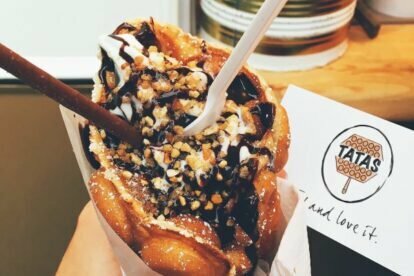 They call their creation “muffles”, which are waffles I can only describe as “bubble-wrap shaped” that are rolled into a cone. Of course there are also yummy toppings to choose from. If you like popping bubble wrap, you will definitely enjoy eating these! I usually go for the basic variety with cinnamon and sugar and share it with a friend: it’s a great way to end the evening! You can always count on Tatas to be at Markthalle Neun’s street food market on Thursdays, which is where I placed the pin on the map. Tatas has its own food truck, so I encourage you to check their Facebook Tatas site. They post their locations every week there.